We offer over 15 years of crop consulting experience, full line of crop insurance products, crop protection products, fertilizers, corn, alfalfa, forage and grass seeds, irrigation supplies including plastic surface ditch and accessories and boots. We have bagged feeds and minerals for special order and of course our liquid supplements, Let our expertise and experience work for you!! Pioneer Hi-Bred is the world's leading developer and supplier of advanced plant genetics to farmers worldwide. 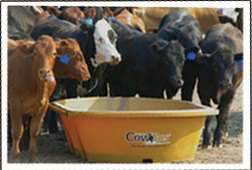 CowBos Liquid Supplements are a convenient, economical means of supplementing your cow/calf herd with protein, energy, vitamins and trace minerals in optimal proportions for maximum performance. Weaver Leather is dedicated to bringing you quality, innovative products that will help your animals look their best in the ring and will have you on your way to the winner’s circle.